The Flower Pot's flower of the day for Tuesday, October 2nd was a Bird of Paradise which has a very interesting background. You can see it pictured here as part of our Jazz bouquet. 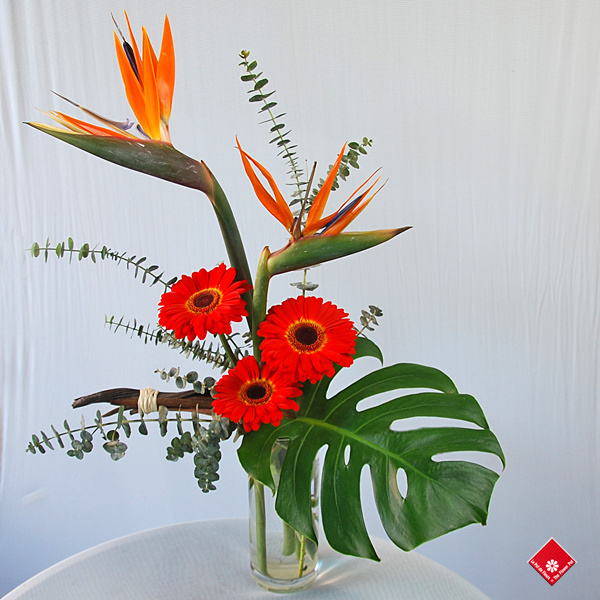 The Bird of Paradise's real name is Strelitzia. The flower was named for George III of the United Kingdom's Queen Consort, Queen Charlotte of the United Kingdom, who was born in Strelitz. According to Wikipedia, Queen Charlotte was a great patroness of the arts as well as an amateur botanist. Thanks to her and her husband's involvement, Kew Gardens, which are also called the Royal Botanic Gardens, greatly expanded. Now, Kew Gardens is a very important botanical research and conservation center that employs 700 people and plays host to about two million visitors a year! Kew Gardens is home to the largest Victorian glasshouse and the largest collection of living plants in the world. In 2003, UNESCO included the gardens on the list of World Heritage Sites. In September The Guardian published a great video about Kew Gardens and the work that is done there to combat the climate crisis (see below). For us here at The Flower Pot, flowers and plants are so important to life. We think that everyone should be involved in saving them and the planet. One of the ways you can do that, as mentioned in the video below, is to tend your own small garden, and be aware of how plants are important to your life. That's where florists come in. It's our job to encourage people to love plants and flowers with our stunning arrangements. If people love greenery, perhaps they will be more careful with the world we live in! For Thanksgiving we are offering a pretty vase arrangement that showcases one of the plants that are so essential to our lives: wheat! You can call 514-938-1234 to order, or order online on our website. For a real Montreal florist experience, come by the store at 1340 Notre Dame Ouest to visit our little plant and flower oasis.